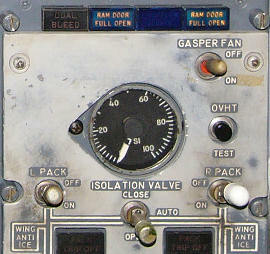 APU or engine 5th and if necessary 9th stage bleed air (hot) is pre-cooled by fan air before entering the pack. Inside the pack, bleed air is cooled by ram air through heat exchangers and an air cycle machine. A water separator collects water condensed by the cooling process to avoid icing. Series 3/5/6/700 pack output temperatures are independently controlled. Series 4/8/900 packs work to the coldest of the three zones, the two warmer zones are then heated by trim air after the mix manifold. 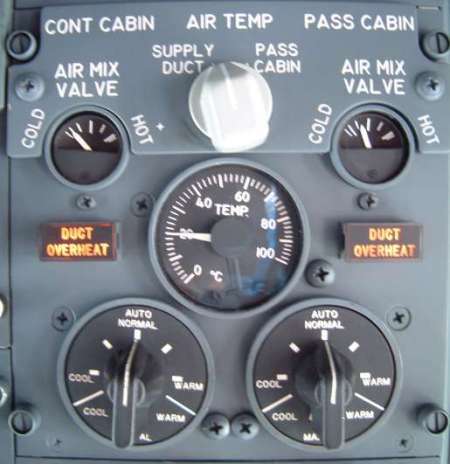 In both series, flight-deck air is taken from before the mix manifold, however series 4/8/900 flight-deck air may also contain trim air. Cause: Duct temperature has exceeded 88C. Remedy: Select cooler temp then trip reset. Cause: Duct temperature overheat or temp controller failure. 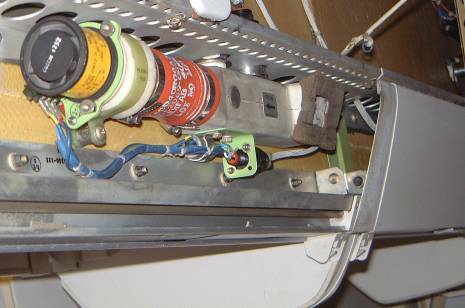 The cabin temperature sensor is behind the small grill located just over the overhead locker on the stbd side at approximately row 3. This is why you get the burning smell of a duct overheat in the cabin when you have the fwd doors open on a cold day and the wind blowing icy air through the cabin. On such a day it is better to use the temperature controls in manual to avoid this. 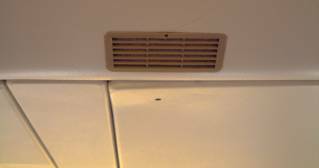 Also if the cabin temperature is not regulating well in flight, you should have an engineer clean the foam air filter behind this grill. 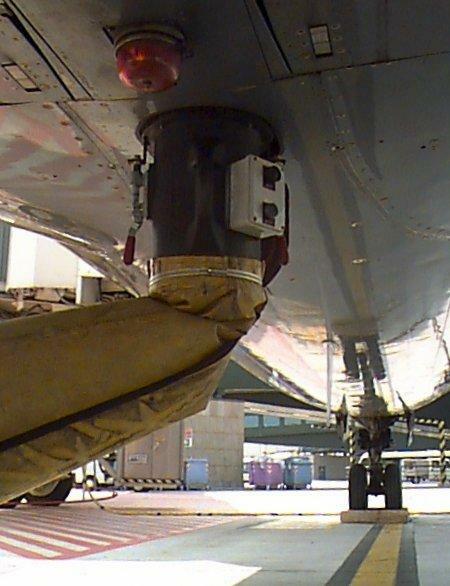 The flightdeck temperature sensor is near the dome light. 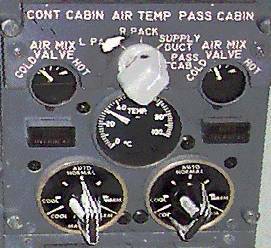 -1/200 Air-conditioning PanelThe -1/200 series air-con panel was very similar to the existing NG panel except that temperatures could also be displayed at the L & R packs. There was no recirculation fan on the 1/200 series but there was a gasper fan (see right). This was an electric fan designed to increase pressure in the gasper system, ie outlets above pax seats, under conditions of low supply pressure or high cold air demand - normally on the ground on a hot day. The gasper fan is still effective even if the packs are off as cabin air is drawn into the distribution ducts, down the risers, into the main manifold and mixing chamber where it is then blown into the cold air risers and ducts and out of the gasper fans. The recirculation fan simply re-circulates filtered cabin air back to the cabin to reduce bleed air requirements. A pack in HIGH flow will produce more cold air than normal, but has a 25% higher bleed air demand. Approximately 25% of the cabin air is recirculated for passenger comfort compared to 50% on the 757/767 and none on the MD80. The recirc fan will switch off if either pack is in high flow, giving a net reduction in the ventilation rate of 15%, so best cooling is achieved with pack(s) AUTO and recirc fan(s) ON; this also reduces pack load, bleed air demand and fuel consumption. 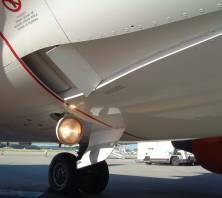 The ventilation rate of the 737-300 is 1900 cubic feet per minute (CFM) or about 13 CFM per passenger. 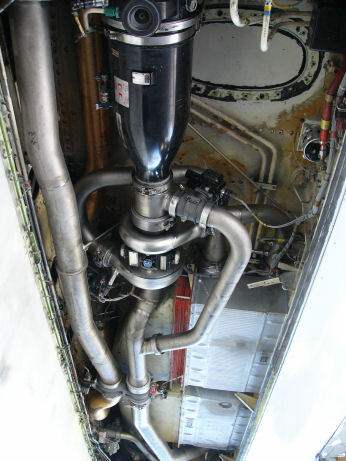 When the larger 737-400 was designed, an extra recirculation fan (also on the –4/8/900) was installed to increase the ventilation rate, and hence comfort levels, for the increased passenger capacity of the larger aircraft. Unfortunately the second fan is quite loud on the flightdeck - as are the NG fan(s). On the ground: 1-500's: Use only one pack from the APU because packs are working hardest when delivering cold air. NG APU's are more powerful so can use both packs for cooling or heating. In fact using both packs causes the APU to burn slightly less fuel than single pack operation. If one pack fails with the pack switches in AUTO, the other will regulate to high flow (unless flaps are down). Note series 1/200's do not have an AUTO mode, the pack switch is simply ON/OFF. The gap between the two RAM DOOR FULL OPEN lights was occupied by a F OUTFLOW CLOSED light on the -1/200. 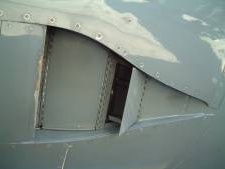 Ram air is controlled by variable geometry inlet doors, turbofans, and on some aircraft variable exhaust louvers. Maximum ram air is available on the ground and on take-off. In-flight there is less cooling requirement so it is modulated by the doors and louvers which reduces both the ram air flow and also drag. 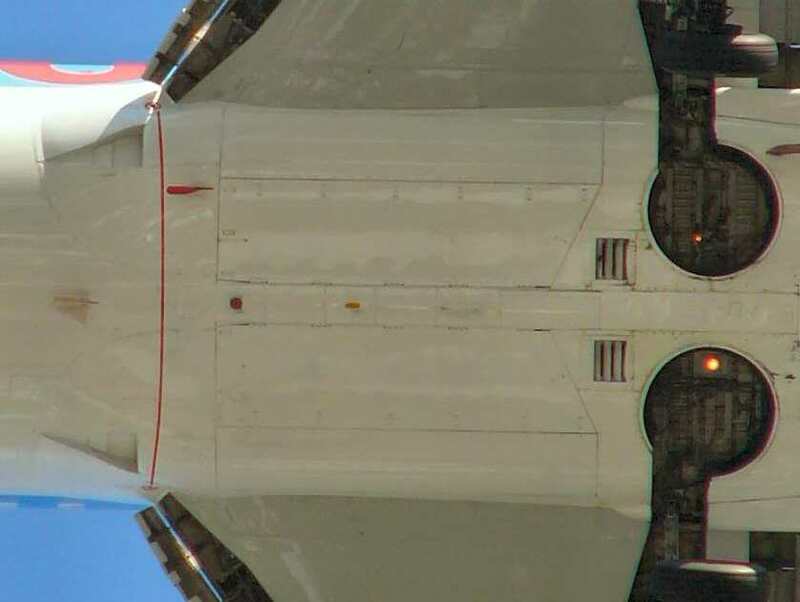 The deflector doors are extended whenever the aircraft is on the ground. The RAM DOOR FULL OPEN lights will be illuminated on the ground and should extinguish during the climb. If they do not, then either the cabin is still very hot and the packs require full ram airflow for cooling or the heat exchanger may be faulty. 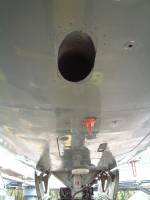 This photo shows the location of the two air conditioning packs underneath the aircraft. Notice that the two ram air inlets have their deflector doors retracted because the aircraft is in-flight. The packs are accessed through the two large access panels between the deflector doors and the wheel well, these panels are hinged inboard. Aft of the access panels are the ram air exit louvers, these will give you a nice warm blast of air on your legs as you stand in the wheel well during your walk-around on a cold winter day! The flight deck panels, display units, c/b panels and E&E bay are all cooled by replacing the warm air with cool air from the cabin with electric fans. The supply fans push air and the exhaust fans pull air through these units. 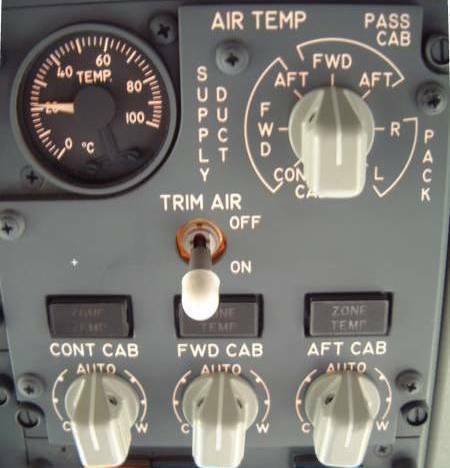 The second fan was added to EFIS equipped aircraft to cool the CRT's in 1986. On the ground, the air is then dumped through the flow control valve (classics) / overboard exhaust valve (NG). In-flight above 2psi cabin differential, the air is used for heating the forward hold. 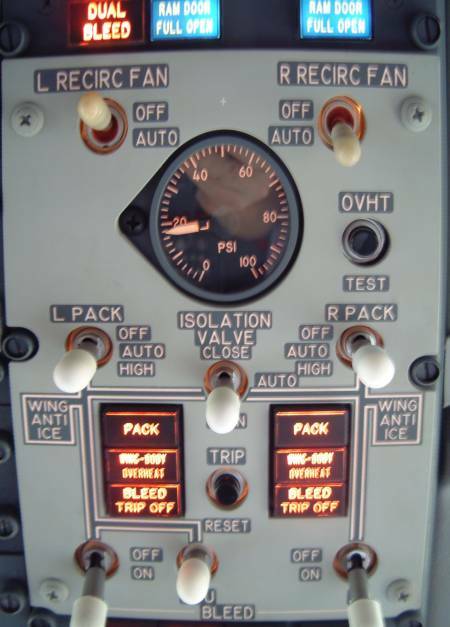 The valve closing can be heard as a sudden hiss on the flightdeck on climb out or during final approach at 2psi. Note both cargo holds are also heated by exhausting cabin air around their walls. The forward hold will maintain at least 40F and the aft hold at least 32F at a distance of 8 inches from the walls. 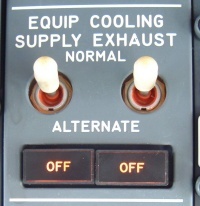 Right: 737-3/900 Equip cooling with separate supply & exhaust fans. Air leaving the air cycle machine is at its coldest and any moisture it contains will condense downstream. This could lead to problems with icing or corrosion so the excess water is removed by the water separator. Air goes into the water separator and through a polyester coalescer bag fixed on a support which collects water mist from the air. The mist becomes water droplets as more moisture goes through the bag. The support has slots that move the air in a circular motion. The air with the water droplets moves to the collection chamber which is a baffle that causes the water and air to make a sharp bend. This separates the heavier water droplets but allows the air to leave freely. The collected water is then drained overboard, you can see this dripping from the packs on the ground at hot & humid airports. If the ACM output air is below 2C warm air is introduced to prevent icing. If you have a noisy air conditioning pack, the coalescer bag may be full of dirt and need changing (like a hoover bag!). When the bag is blocked the air bypasses the water separator. With the panels removed you can see the water separator and heat exchangers. This is being used more frequently as airports start banning the use of the APU on the ground. Pre-conditioned air is attached here straight into the mix manifold. 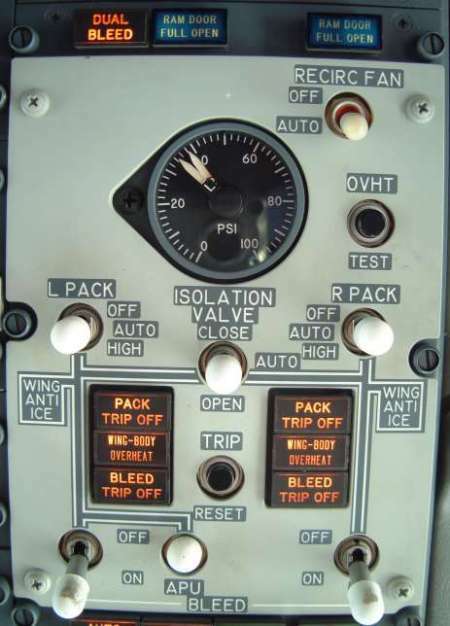 With engine bleeds ON, do not operate the associated pack in HIGH for takeoff, approach or landing. In every home equipped with central hvac repair lewisboro conditioning, there comes a time when repair or replace becomes a major HVAC question. These tips will help you better understand the current state of air conditioning technology. Demand evidence that a company is Bonded, Insured and Licensed to work at your residence.